This fabulous beastie is a Melophone. Click on the pictures for enlargements. What is it ? It's a cross between a guitar and a harmonium. 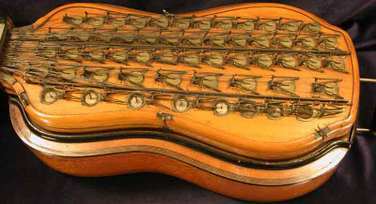 Each button on the 'fretboard' is linked to a reed inside the body of the instrument. The wind is supplied by a double action bellows concealed within the instrument and actuated by a piston working through the lower end of the case. It was invented by Leclèrc in Paris 1837 who seems to have been a clockmaker. There can't be too many examples around; there's one at the Museum of Fine Arts in Boston (although I don't remember seeing it there) with 104 'keys' and another one at the Powerhouse Museum in Sydney, Australia with 84 'keys'. The one above also has 84 keys. The one in Australia was made by Brown & Cleric, indicating that there may have been more than one company that made these. This particular example is for sale soon, priced at $6500 US. Here are the full details. A rare and all original French Melophone from the mid 19 century in astonishing condition. Birdseye maple body and the sides of the cover, spruce top of the cover decorated flower ornaments in ink. A complete restoration had been performed some years ago to make it fully playable, but it is not guaranteed that everything still works after changing hand a couple of times. The whole mechanism is very complicated, brass keywork seems to be in tune and every note works. I have never seen one in this great condition and I think there is hardly anybody around who knows how to restore a melophone. It was propably made for some important person since there is an original coin plaque of the French general attached to it, reading: Henri de Lorraine, Comte de Harcourt, Grande Escuier (Ecuyer) de France. 8 chromatic Bass reeds 9 chromatic Tenor reeds 13 chromatic Alto reeds 13 chromatic Soprano reeds 12 chromatic Sopranino reeds 84 Ivory roller buttons - total length without airbellhadle 29 inches - length of the body 19 3/4 inches - upper bout 9 3/4 inches - lower bout 11 1/2 inches - middle bout 8 5/8 inches - body depth 4 3/8 inches - body depth including cover 7 1/4 inches. There is also a melophone in the Metropolitan Museum of Art in New York. One composer named Jacques Halevy used it in his opera "Guido et Ginevra" in the 19th century. It's worth seeing if you happen to be in NY. Just go to the 2nd floor and look for the Mertens Gallery of Musical Instruments. I am looking to buy a melophone. If you have one for sale or know of any that might be for sale, please contact me at Screenery[AT]gmail[DOT]com.